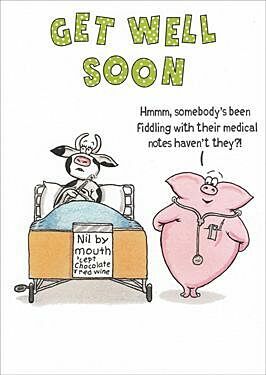 This greeting card measures 15.5cm x 15.5cm and features a funny image of a pig as a doctor and a cow as a paitient. The Pig is saying 'Hmmm, somebody's been fiddling with their medical notes haven't they?! ', the medical notes read 'Nil by mouth 'cept Chocolate & Red Wine.